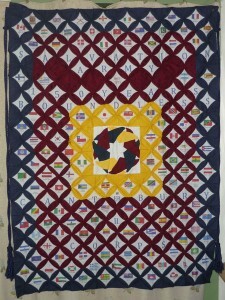 Bob’s quilt is a wall-hanging banner, made to mark the 150th Anniversary of The Salvation Army. The design incorporates the flags of the 127 countries where the Salvation Army has a presence, as well the logo and name of the 2015 Congress, ‘Boundless’. Bob explains how he came up with the design, the support of other members of The Salvation Army and where the banner has been exhibited. Later he talks more about his interest in learning to sew and quiltmaking, his fear of the ‘quilt police’ and his appreciation of quilting as a creative art form. Pam Harrison [PH]: Right hello this this interview is for Talking Quilts. The name of the interviewee is Bob Crick, the name of the interviewer is Pam Harrison and the location is Bob’s home which is in Chartham near Canterbury in Kent… um the date is the 22nd of September 2015 [PH clears throat] and the ID number is 2015.051. Okay. Good morning, Bob. 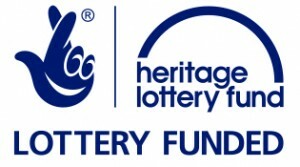 Thank you for agreeing to be part of this project. Bob Crick [BC]: My pleasure Pam [Pam laughs]. PH: Yeah. Um what we’re going to start with is talking about a particular quilt that you’ve brought along um and you’ve agreed to talk about. So can we start by you describing the quilt… tell me about…the colours, the patterns and er the fabrics that you’ve used. BC: Certainly. 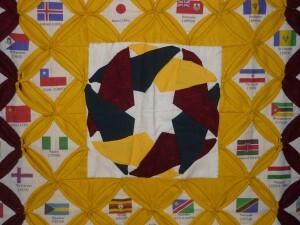 The quilt is um a… the Salvation Army flag. So therefore it is in the colours of the Salvation Army which is blue, maroon, and yellow. 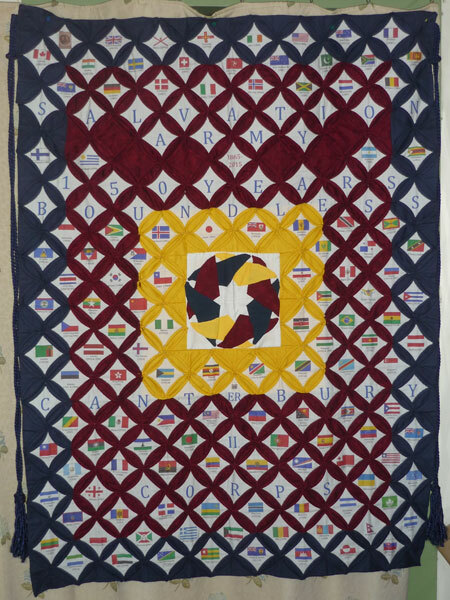 The design of the quilt is a Cathedral Window design, so I can incorporate letters and, um, pictures of flags, because the idea was to celebrate the 150th anniversary of the Salvation Army, which is 2015, from the time when William and Catherine Booth started the work in 1865. PH: Right…okay. [PH laughs]. So do you want to carry on then? Tell me about the title of it? BC: Yes certainly. [PH: Yeah?] 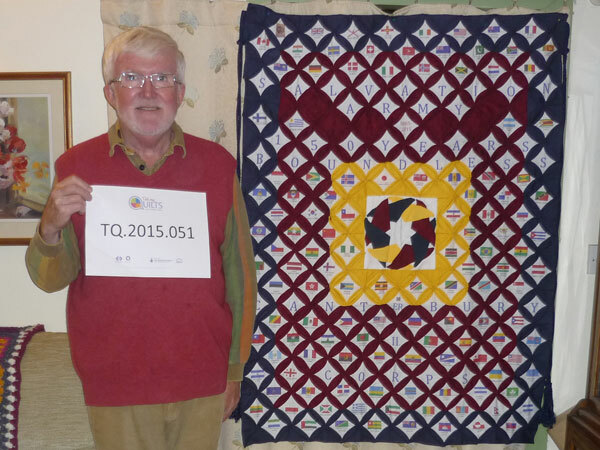 The…technically the quilt is called Boundless. Um Boundless is the name of the theme that the Salvation Army used for, er, it’s 150th anniversary. That comes from a hymn written by William Booth in 1912 which was called ‘Oh Boundless Salvation’. And so the Salvation Army decided that the theme for 2015 er 150th anniversary was to be Boundless. My own idea, or the history behind the quilt was, I was visiting the William Booth Memorial College er in April 2014 and on the top floor they have a museum. In the museum of the history of the Salvation Army is a picture of the Salvation Army when it was 35 years old at the turn of the 1900’s into the 20th Century. And this picture was basically Greco-Roman in style with Salvation Army people standing in the middle of it, but surrounding it were the flags of the countries that the Salvation Army were operating in in the year 1900 and those flags were linked together by, er, a chain all the way around the border of the picture which combined in the anchor at the bottom of the picture. I didn’t think anything of it at the time, I took a photograph of the picture but as I was leaving I got into a conversation with the archivist who looks after the museum and he told me um about the 150th anniversary in 2015 and I went away and started to think I wonder if, um, it would be worth trying to put together a quilt which would be more like a banner using the Salvation Army colours, the same proportion of a Salvation Army flag, um, this particular quilt is three quarters the size of a Salvation Army flag. A Salvation Army flag is six foot by four foot and this quilt is four foot by three foot. And so it would look more like a banner and not a flag to hang from a pole. I then, using excel spreadsheet, designed um… where I wanted to put words like ‘Salvation Army’, ‘One Hundred and Fifty Years’, ‘1865-2015’, the word ‘Boundless’, and the name of the Church that I attend, or the Corps as it is called in Canterbury, er, Canterbury Corps. The design of the quilt um also what I wanted to do was to pick up er the motif which was er a motif designed by two Norwegian men that the Salvation Army had adopted, which were the colours of the Salvation Army flag in the forms of doves which are interlinking wings of the doves which form as its centre the star which sits in the centre of the Salvation Army flag and is normally on the flag. That star is surrounded by the words ‘blood’ and ‘fire’, but this motif on the piece of paper was just these interlinking, er, wings of a dove in blue, maroon and yellow. I had to extrapolate it from the piece of paper to a size that would fit an eight inch square. That was interesting [PH and BC laugh]. I had about three or four go’s before I got it right and even then if a member of the quilt police were to come and inspect it now it wouldn’t pass muster but um it was as close as we could get [PH: Yeah] to get on to a square of white fabric so it would look like the motif on the piece of paper. PH: Yes. And that’s in the centre of this? BC: Yes. [PH: Yeah.] So that forms a centre of the banner. [PH: Yeah.] Then um I did I measured the Salvation Army flag, the size of the yellow in the flag the maroon and the blue, and basically used the cathedral window quilt pattern to create the design. The cathedral window pattern appealed to me because of Canterbury Cathedral and as a young boy I was very fortunate to go to a school that literally was in the shadow of Canterbury Cathedral, and so it had a sort of historical route for me in in that regards. So the idea of using the cathedral windows suited both my own personal history and the ability to produce what you now see as the banner. [PH: Yeah.] I then wrote out the words ‘Salvation Army’ ‘1865’ ‘150 years’ ‘boundless’ ‘Canterbury’ and ‘Corps’, er and realised that if I was to go for a banner which was 36 inches wide and 48 inches deep I would have alternating diamonds of nine, eight, nine, eight, nine, eight which was great until you get to the word ‘Canterbury’ because Salvation Army 150 years etc. all fitted nine eight nine eight. [PH: Yeah.] Canterbury has ten letters. [PH: Mhm.] And when I was looking at the word ‘Canterbury’ I was scratching my head thinking now how am I going to get Canterbury which is ten letters on a quilt which has only got nine diamonds wide and then I noticed that ER was the centre two letters of the word Canterbury and so I then googled um… er…Elizabeth Regina wondering was there anything with regard to Elizabeth II’s reign, er, going to be happening in 2015. Now bearing in mind, I was designing this in the spring of 2014. Er so it was slightly presumptive of me to say that if her Majesty the Queen was to live until the 9th September 2015 she would become Britain’s longest reigning sovereign. [PH: Yeah.] So it seemed appropriate that to put the ER in one diamond [PH: Yeah.] and the crown above it and the couple of two’s the… the… the two I’s underneath it so you had ER II so you could see ER II so it had a combined relevance. [PH: Yes.] So you had both the 150th anniversary of the Salvation Army and it could be combined with the celebration of her Majesty becoming the longest reigning British sovereign. That was fine and that took up about 54 diamonds… so I then thought ‘well what do I do with the other 128 diamonds that were left’ and then um it dawned on me that I could that the Salvation Army was operational in 126 counties and so if I was to put the flag of each country and the date in which the Salvation Army started on the flag then 126 of those 128 diamonds could be, er, filled and that would fill up the majority of the space. BC: So that was quite pleasing. I had discovered that earlier that I could print on to fabric just using my inkjet printer, so that wasn’t a problem. My daughter, very kindly, showed me how to create diamonds on a sheet of A4 words so I could get about eight diamonds per A4 sheet. But the fabric um to print on was most probably, along with the inkjet er colour cartridges, the most expensive part of producing the quilt. So basically I just designed this and I thought I would do it chronologically. Once I’d completed the design I thought it was appropriate that I should actually ask the permission of the leader of the Church at Canterbury Corps ‘is this something she wants’ because it seemed to me that the only relevant place for it to hang in 2015 er was the Salvation Army in Canterbury. So I wrote to her and she gave me her blessing and so I started to purchase the fabric [PH: Yeah.] and get on with the work that was needed to start to produce the quilt. The um… the great challenge I found with the, er, cathedral window design is technically it is origami in fabric. [PH: Yes] [PH laughs]. So there is effectively 108 four inch squares but you have to start with 8½ inch squares in order to fold them all down to make the four inch square which you then sew together before, er, you can start hand sewing um the alpha numerics and the pictures of the flags and the [PH: Yeah.] names of the countries actually into each of the diamonds. [PH: Yeah.] The machine sewing of the squares of fabrics wasn’t that difficult, er, and once you got into a pattern both of cutting and machine sewing, and the folding that was necessary, it was it was a labour of love. I, I looked at it you know there was something like 38 blue squares, 50 maroon squares, 18 yellow squares and two white squares in the middle to make the whole banner and I knew I had to do the these 108 squares and so it was just a case of gritting your teeth and getting on with it. Um please don’t ask me how long it took… [PH: No] [PH laughs]. I can’t remember. [BC and PH laugh]. Um but it was just one of those jobs you knew you had to do and you knew you had to get it done. PH: Yeah. Were you sewing most days on this or? BC: Well yes I was… like an idiot, I had just started a City and Guilds course in Textiles at Morley College er Level One so I was trying to find time to do my coursework for the Textiles course, as well as the time here, but I’m fortunate [PH: Yeah] I’m a retired person I don’t go to work so I, I did have um time. It was just a question of, er, will to bring the various things together but as I’d discovered with any quilt it is an evolutionary process and a journey rather than, um, knowing right at the beginning how it’s going to turn out at the end. And it dawned on me that the most sensible thing to do would be to sew, um, two lots of strips together, the width ways, so you have 18 um diamonds [BC coughs] and have six lots of two strips. Because that would then be easier to handle when it came to hand sewing er each of the diamonds into the diamonds that will create the cathedral window quilt design. [PH: Yeah.] I then paused a bit and thought to myself I wonder if there is anybody in the Salvation Army in Canterbury who would like to assist with the hand sewing of the diamonds and so it could be not just my project but it could be a project which involved other people that were interested in sewing or had some craft skill. So I mentioned this to the Corps Officer she advertised it in the announcements for the Sunday service and five volunteers came across within about two weeks. One was a professional seamstress… which was a little daunting she asked me lots of very serious questions which I didn’t know the answers to, but, um, [BC coughs] and the, but she very kindly did the bottom section and I’ll come back to that in a minute. There were two other ladies very enthusiastic crafts people um one, er, a lady I’d known since I was a child she’s, er, now has been um a Brown Owl and Guide Leader and everything else and she knew a friend that had done the Cathedral Quilt design so she was perfectly happy with what was required. And this other lady, er, who is the wife of the Verger of Canterbury Cathedral she was very enthusiastic Debbie, er, to be involved in this project and then the fourth lady, erm, Jane who for her was going to be a journey, I think in hindsight now, to help her come to terms with an illness for which she’s had to have chemotherapy recently. PH: Yes. We’ll stop there [inaudible]. Okay. BC: So as I say for the fourth lady it was, er, obviously a cathartic experience for her. The gentleman who volunteered to do it, he within a couple of weeks realised that he most probably had bitten off more than he could chew, contacted me and said he didn’t have time to do it and er I collected it from him and did the strip that he was going to do. So basically I did two strips and there were four other volunteers who did the other four strips. I’d mentioned Debbie um and I spoke to her last Sunday and she’s perfectly happy for me to say this… she did the two centre strips which constitute the yellow. [PH: Yep.] And the um the motif in the middle. [PH: Yeah.] And she had said to me at the time whilst she was doing the sewing she found it was… an amazing experience to realise, er, by sewing in each of these diamonds of the countries the flags of the countries, and the dates how the Salvation Army had grown in 150 years and, and, and of course when you look at the dates, they look at corresponding events in other things that are going in the world at the time. [PH: Yes yeah.] And so she said she was actually very um privileged she felt very privileged to be part of producing this banner. The… and so she basically took the two centre pieces joined them together and then we put more diamonds in the centre and then she very kindly appliqued the motif that I had done of the interwoving doves into the centre. Another person I spoke to last Sunday, um, Marian and she is happy for me to say this and I confirmed this by e-mail yesterday… her bottom strip started in Guam G-U-A-M in 1994 and that was the year her granddaughter was born and she found it an equally, um, revealing process for her to think what… where the Salvation Army had gone from 1994 to 2015, [PH: Yeah.] well 2014 [PH: Yes.] to be exact [PH: Yes yeah.]. But we can come back to that in a minute. And she said that that so for her it had both a, um, a spiritual journey with regard to imagining the growth of the Salvation Army in the last 20 so years as well as a family link watching her own family grow up and the life of her granddaughter. And of course all these things come out in conversation much later [PH: Yes.] er, we then we… we had tried to aim to have the banner completed by the Easter of 2015, but in reality, um, we managed to get it all done by the Pentecost of 2015 which was the end of May which was four week before the congress. PH: Right. That’s with the backing and everything? BC: That’s with the backing and everything yes. PH: Let’s talking about that. BC: The back. [PH: Yeah.] So it gave a brief history as to the motif in the middle and the journey. So, as well as having a piece of paper that would hang on a… in a picture frame beside the banner so people could read it [PH: Yes. ], we managed to use Bondaweb [PH: Oh right.] er just to print it [PH: Oh yeah.] onto fabric and then iron it onto the back of the banner itself [PH: Yes.]. So it’s a permanent feature. [PH: Yeah yeah.] But it’s a permanent feature dated May 2015 when the Salvation Army were operating in 126 countries. BC: So, so, so that’s the banner. [PH: yeah.] And it was also Debbie’s idea to do the tassels, er, the erm the cords that go down the sides of the banner [PH:Yes.]. So it was distinct from a Salvation Army flag [PH:Yes.] she said most banners… I can’t remember what they’re called I call them tassels [PH:Yeah.] hanging down either side of the banner. I, I, I remember vaguely from my time in the Navy of how to produce what they call a ‘Turk’s head’ [PH: Yes] [PH laughs] and then, um, produced the tassels there, er, and then she very kindly sewed them onto the side of the banner because she asked permission to use the banner, er, as part of an RE [sic Religious Education] lesson at the school that her children go to [PH: Oh right.] in Canterbury [PH: Yes.] so she took the banner one day to the school just as an example of, er, the history of the Salvation Army [PH: Yeah.] over the last 150 years as part of a Religious Education lesson. PH: And that’s attached to one place is it? PH: At the top yeah. BC: So, so, so it could hang from a pole. [PH: Yeah.] Um the [BC coughs]. The, the, the other challenge… which we didn’t notice at the time, but my daughter who is a primary school teacher, er, very kindly pointed out was where I had got all the words ‘Salvation Army’ ‘1865 to 2015’ ‘150 years’ and ‘Boundless’, she said ‘it is incredibly busy Dad and you need to break it up’. [PH: Yeah.] Plus the fact, er, she pointed out to me that while you know what the words are running horizontally [PH: Yeah.] what you don’t know is what words will be made up diagonally when all the words are placed together [PH: Yeah.]. And she’s quite right. I had not considered that. [PH: No.] And there’s no point in hanging something up in the Church where some, some bright little man says ‘oh look mummy there’s a….’ you know. [PH: Yes.] [BC and PH laugh]. So we decided rather than actually having the numbers ‘1865’ in each of the individual diamonds [PH: Yeah.] we would just produce it in one diamond ‘1865 to 2015’ and it would leave other diamonds just in the colour [PH: Yes.] of the background fabric. [PH: Yeah.] So it broke up ‘Salvation Army’ and ‘150 years, er, Boundless’ and that actually has given a much better effect. [PH: Yeah.] When you when you see it at a distance you can actually read it. [PH: Yes.] And it’s just not a jumble of letters. [PH: Yeah.] Um. Then I decided to go up to one of the days I wasn’t going to go for the whole five days cos [sic because] the congress had brought people from all over the world to London between the 1st and the 5th July. I opted to go for the second day, um, I attended one session in the morning and then I thought ‘right I shall go and see where the banner is hanging’ just out of curiosity more than anything else. And, erm, there was this exhibition in the perimeter of the O2 arena which was called ‘The Boundless Journey’ and when you walked in it was very humbling to see my name and the name of the leader of the Church in the acknowledgements lists, um, the people who’d made contributions to this exhibition, but the presentation of it was very contemporary, very high quality and I was at first wondering where on earth would the banner fit? [PH: Yeah.] And it was very good historical journey, as you meandered round what was a curve of exhibitions, [PH: Yeah.] talking about the history of the Salvation Army and then right at the end was this archway, and this archway was really, er, an archway of the present going into the future [PH: Mhm.] and there at the archway was the banner [PH: Right.]. And in many respects I thought actually that’s incredibly sensible. [PH: Yeah yeah.] Because the banner is just a snapshot [PH: Yes.] of the Salvation Army in 2015. [PH: Yes.] It’s like when you balance books [PH: Yes] [PH laughs] on a particular date you know. It is just a snapshot of what life is on that particular day. [PH: Yeah, yeah.] And um and it was very humbling, it was very humbling to see people looking at it, taking photographs of it [PH: Yeah.] standing beside it and being photographed by it and everything else, and I thought to myself ‘oh, right, okay’, you know. Er, it, it and it was humbling from the point of view that I thought ‘well it, it, it was just an idea’ that I’d had um 15 months earlier. It was humbling because it gave an opportunity for other people to be part of it [PH: Yeah.] and they each experienced their own journey while they were sewing [PH: Yeah.]. And it was humbling that now it was becoming just a… as I say, a snapshot of that moment in time in fabric, in quilting, er, of something which in many respects was a summary of the last two or three years of my life as well [PH: Yeah, yeah.]. You looked at it and you thought actually yes there’s lots of tributaries in this quilt [PH: Yeah.]. It’s not just me. [PH: Yeah.] It, it, it’s much greater than me. [PH: Yes.] Um and even as I speak now thinking about it, it, is it’s quite moving to think that you could have an idea you could invest time, money, energy, input from other people and therefore bring something together which becomes something that is meaningful. [PH: Yeah.] Er. Do I have permission to digress slightly? [PH laughs] [PH: Slightly.] We… there’s… an octogenarian mutiny going on at the Salvation Army at the moment. I say octogenarian because my mother very kindly contributed towards the cost of the fabric and when I showed her the banner, er, when it was finished [PH: Yeah.] she was thought it was wonderful. [PH: Yeah.] When the banner went up in the Salvation Army some friends of hers also liked it [PH: Really?] and seemed to take a possession of it that surprised me. [PH: Right.] For me I had let it go [PH: Yeah. ], I had done it, given it, and that there it was. PH: And you’d given it to the Canterbury Corps? BC: Yes. [PH: Yeah.] Given it to the Canterbury Corps so there was no umbilical for me. PH: Yeah it had gone. BC: It had gone. For my mother and some of the elderly ladies of the Corps it now belonged to them [PH: Right.] because I’m always mindful that everything is can become dated and I had suggested to the Corps leader that, when the disaster occurred in Nepal in April this year, as a gesture of solidarity [PH: Yes.] with the people in Nepal, at the appropriate time we could send this banner to them [PH: Yeah.] in their, er, situation, which is tragic [PH: Yeah.] compared to ours in Britain. But as I say we had this octogenarian mutiny who feels it, it has a home in Canterbury [PH: Yes.] and not in Nepal so. Thankfully the, the leader of the Church had said ‘we’ll wait until the end of the year and decide on its future after that’ [PH: Yeah.] But for me personally it doesn’t have anything you know, I have the photographic records, and I have had the experience and it’s been a, a huge privilege to allow, er, others to participate in it and for them to have their own journey [PH: Yeah.] in its production. PH: Yeah…and you’ve got all those memories and you’ve recorded them haven’t you? BC: So, so I have I have those memories… [PH: Yeah.] Written down with the photographs. PH: And it’s hung now at the moment actually in where the Canterbury Corps meet is that right? PH: Oh, I see, yeah. BC: … but I, I decided I brought it down printed off the flag with Slovakia 2015 and put it in effectively as the last flag of the yea,r er, on the banner [PH: Yeah.]. And put the 1865 to 2015 diamond up in the middle between the ‘R’ and the ‘M’ of the ‘Army’ [PH: Yeah.] and then slightly moved other flags down. So instead of having a straight line underneath ‘Army’ it is slightly curved [PH: Yes.] just to add a bit of artistic effect. [PH: Yeah.] Um which was one of my personal observations having sawn it, it looked too linear when we hung it and I thought actually I could have been a little bit more imaginative um and brought the flags down. So the arrival of Slovakia and having to move some of the diamonds around, had to move 10 in all [PH: Oh gosh.] and hand sew it again. [PH: Yeah.] Again it didn’t take that long. [PH: Yeah.] Once you get into the swing of these things they, they, erm, it’s good telly watching stuff. [PH and BC laugh]. So… that’s, that’s its journey. PH: Yeah, yeah it’s been a… [microphone noise] right, okay. Um…well we were next I was going to ask you about when you your own involvement in quiltmaking or when you first started making quilts? Kaye asked me if I would bring the banner up to the class and, er, explain to the class [PH: Yeah.] what had happened [PH: Yeah.] and so, there were these blend of people doing these three types of courses in the one class in one evening and… they came from different countries in my own, in my own class City and Guilds we had a Brazilian, Chilean, Spanish, and Irish lady [PH: Gosh.] and as the banner was laid out on one of the big tables what did surprise me was how… each of them… in their own turn actually went and touched their own flag, [PH: Yeah. Yeah.] like it was a connection for them. [PH: Yeah. Yeah.] And one of the ladies had been in this country for 30 years, [PH: Mmm.] but she saw her flag, [PH: Yes.] her country her home [PH: Yeah.] and she wanted to touch it. [PH: Yeah.] And I it was interesting watching the impact even that was having on the people at that time the, they, they wanted to be connected to it in a way [PH: Yes.] by, by touching their national flag. PH: … flag. Yeah. That’s really interesting isn’t it? BC: Yes. [PH: Yeah.] And… and as you say can reach and be for them a contribution to their journey so my… feeling, for whatever it’s worth, is that I think patchwork and quilting personally I think it is a very undersold, um, art form. [PH: Right.] And when I went round the NEC [sic National Exhibition Centre] International Festival of Quilts I thought to myself, I was tempted to write to BBC One Show and say why didn’t you get there and do this because this is as er significant expression of, um, people’s skills and abilities and creative energies as any other. [PH: Yeah.] You know and as an aside, er, with regard to the NEC exhibition I was standing in the gents loo washing my hands having taken a comfort break and said to this other gentleman I said ‘you do realise that this is the quietest place in the NEC don’t you?’ and he looked at me and he said ‘Why?’ I said ‘we are definitely in the minority here’ [laughter]. [PH: Yeah]. And you know, I mean it’s true, it’s just something which obviously ladies have found er immeasurable satisfaction in over the years, but I would say I would personally say equally say, um, it is something which men who have time or choose to give themselves time could find a form of artistic expression. PH: Yeah. Yeah. And some do. PH: [PH laughs] As you said. PH: When they have that opportunity yeah. [BC: Mm.] And is there anything that you don’t enjoy about quiltmaking because it’s very clear how much you do enjoy? BC: [pause for 8 seconds]…I don’t enjoy about quiltmaking. BC: I… I think…the er…um…[BC pauses then laughs]… the reason I chuckle, er and I’m I’m daunted by it, er, is that um there is this phrase I’ve heard called the quilt police. [PH: Right.] You know where some people will come along and be, er, quite pernickety about the, the quality of either a stitch finish or um a… a design or pattern or anything else and everyth… that sort of thing and I think to myself… yes, there is a place for excellence. [PH: Yeah.] I don’t have a difficulty with that. [PH: Yeah.] And, put in the right way you can promote somebody to do something better. [PH: Yeah.] Um… the, the only thing I found, slightly, um, disappointing I think, [PH: Yeah.] was some people by virtue I think just as their personality and I you know could, could be could express criticism in a way which you might actually if you if you just stopped to say well actually you’re quite right, [PH: Yeah.] but you could be more constructive [PH: Yeah.] about how that might have been done. I mean I could look at this banner [PH: Yeah.] and pick a lot of things out [PH: Yes.] and I think everybody who does any sort of work once they’ve finished it [PH: Yes.] ‘well I’ll go back and do this’ or ‘I’ll go back and do that’ but you have to actually draw a line and say right this is it, [PH: Yes.] end of story. And regardless of what some pernickety so and so may or may not say out of my hearing frankly it does not matter. [PH: No.] Because I’ve got to draw a line somewhere. [PH: Yeah.] This ,this, er, so you know if you were to ask me, but I think in fairness I mean that’s true of anything in life. [PH: Yeah. Yes.] You know, um and so the only thing that I have come across, er, in anything with regard to patchwork and quilting I’ll say is I think it’s a lovely phrase called the quilt police, I mean I, I jokingly said it ‘I think it’s more like quilt traffic wardens really’ [BC laughs] but you know. And that’s no offense to anybody who’s a traffic warden who might look at this. [PH: Yeah.] But you know it’s that love hate relationship you have when you’ve been nicked, [PH: Yes.] you know, and caught out. [PH: Yeah.] But er um the… that, but no no, I it’s, er, I think it’s a wonderful pastime and I think it has great opportunities and I do believe that you know, young people… it, should be exposed to it, um, a lot more. If nothing else at a time in their life to get their creative juices flowing if they’re if they’re not naturally good at drawing. [PH: Yeah.] or not naturally, um, good at perspective and everything else because I think actually quilt quilting is a wonderful halfway house [PH: Mmm.] between, not dismissing artistic creativity completely and saying ‘oh I can’t do that I can’t draw’, but I, I think patchwork and quilting is a wonderful halfway house between those who are naturally gifted with um wonderful art and creative work and everything else but it’s it enables you to look at something and say ‘oh that colour might work’ [PH: Yeah.] and ‘that shape might work’. And, and, and it and I think also…the the, the real joy for me is how it can relate to the person that you’re going to give the final product to [PH: Yes, yeah, yeah.] and hopefully what it’ll mean for them. PH: Yeah. Yeah. And do you have when you’re quilting and making quilts do you have a special space in the house that you use? Or do you… just… move around? [PH and BC laugh]. BC: Yes, it does become a little bit of a tour de force. There is I do have a space where I have a table and the sewing machine and even in three years far too much fabric than is good for me. [PH: Yes.] Um and I am a bit anally retentive in as much that I keep them in folders according to their colours and everything else [PH: Yeah.] so it’s not sort of lying in a pile. But if I’ve got to do big work I tend to work on the surface in the kitchen [PH: Yeah.] because that allows me the space, especially when it comes to cutting [PH: Yeah.] and that sort of thing and er of course when it’s hand sewing, um, you can sit [PH: Yeah.] in the lounge and you can watch it. And if I know I’m going on journeys, er, for example I mentioned earlier the trip to Australia, I can prepare various bits of fabric and everything else [PH: Yes.] and so I can hand sew. [PH: Right, yes.] Er while I’m on the journey. I, I do not have um a problem pulling the stuff out on a train [PH: No.] and doing it. [PH: Yeah.] You know, people will look at you, some people will smirk. Um, wondering why a white bearded gentleman is sitting there doing that thinking that he must be sort of, er, statemented in some lunatic asylum, but um no, generally speaking I’ve found that especially on journeys people come along and talk about it. [PH: Yeah.] They will ask a question. [PH: Yeah.] You can be sitting in an airport lounge waiting [PH: Yeah.] sometimes for a long time. [PH: Yes] [Laughs]. And you can crack on with a fair bit of stuff and people who are equally not embarrassed by these things [PH: Yeah.] will come along and it can become a forum for conversation, [PH: Yeah.] as much as pets can be a forum, as much as babies can be [PH: Yeah.] a forum, [PH: Yeah.] you know. So I find that um you know with a little bit of forethought, er, doing things like this can be a basis just to converse with people [PH: Yeah.] who you would not have ordinarily have had a conversation with. PH: … yeah. So you don’t have a strong preference for either? Or do you I should ask [PH and BC laugh]. PH: You’ll do it [laughs]. BC: … I will do it. So therefore if you were to ask me then machine… quilting does appeal and I suppose with this banner I knew I could get away with the square the ori, squares, the origami, sewing them all together, but I knew they’d be a point in which I’d have to hand sew [PH: Yeah.] um all 182 [PH laughs] diamonds into those diamonds. [PH: Yeah.] Um, because you could not machine sew that. [PH: Yeah.] Well you could but it’d look pretty hideous. [PH: Yeah.] And so you had to use a hidden stitch to er, get the diamonds in, but I think I have learned a balance between that which is machine sewn and that which, you know, you got to do and you can sit and you can watch the telly or listen to the radio or you know, sometimes even the having a conversation with other people while you are doing it is. [PH: Yes.] They’re… for me, um, so no, I wouldn’t say I have a preference on one way of t’other [sic the other] but in specific answer to your question fi I can machine sew [BC and PH sew] in order to get it… done quicker [BC laughs]. [PH: Yes, yeah, yes] I will machine. PH: Yeah. And if we looked at your ideas about other quilts, [PH coughs] what do you look for or notice in other quilts? You know, if you’re thinking about what makes a good quilt not your own quilts but… other quilts you see? BC: Um I’ll, I’ll, I’ll be specific for a second I saw one quilt in the NEC this year, this, this lady had done er, a seaside scene and managed to achieve, er three dimension in this quilt. [PH: Right yeah.] And that was with clever use of embroidery, er, sewn. [PH: Oh yeah.] And you know, wonderful beach scene which partly reminded me of my childhood when we used to go picking cockles and whelks and things like that in Ramsgate and you had beach huts and everything else and so there was an aspect of er [BC clears throat] an emotional journey there, but she had managed to bring together, in this one picture, and it was a picture in fabric and it was patchwork in many respects, um, dimensional work and it was a, a piece of great beauty. At the same time almost next to it was somebody from Australia who did a lot of natural dyeing work and they had produced er a brilliant um patchwork of the Sydney Opera House. [PH: Right.] Having done the natural dyes in the, in the fabric. [PH: Yeah.] And then brought it together and because I, when I was out in Australia I went I went to the Sydney Opera House, er, while I was there [BC clears throat] and I kept looking at it and thought to myself ‘wow’. You know it was it was a wonderful silhouette, so it was, er, a contrast of sort of reds oranges blues at night, but you saw the definite shape. That very distinctive er shape [PH: Yes.] of the Sydney Opera House, but it was in hand dyed fabric. [PH: Right. Yeah.] Managed to achieve that with a little water front outside cos [sic because] you’ve got the wonderful harbour just outside and everything else and the Sydney Opera House and I thought to myself ‘wow, that that is incredible,’ you know. So when I’m looking at odd shaped things or thinking… how do they do that? [PH: Yes.] You know. And I mean in many respects it’s actually quite fun you look and think how on earth did they get there and you begin to see it’s genius [PH: Yeah.] when you’re looking at other patchwork. And um and I think also the one real benefit I found of the textiles course was getting a much greater appreciation of colour. [PH: Yeah.] How to bring colours together. [PH: Yeah.] How some colours will work, some patterns will work [PH: Yeah.] with, with certain shapes and everything else and all that er I, I think that, um, there is there is real genius in people’s appreciation of… this is the pattern I want to do, these are the range of colours I’m going to do, I’m gonna [sic going to] bring it all together, I’m gonna [sic going to] make these shapes and somehow I’m going to make this picture. [PH: Yeah.] And that’s how I believe is a very understated art form. [PH: Yeah.] I don’t think it has the same level of celebrity [PH: No.] um that other art forms do. [PH: Yeah. Yeah.] Let’s put it that way. PH: That’s right. Yes. Yes. Yeah. [PH clears throat]. 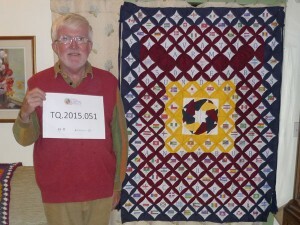 Can you think…of yourself as a quilter what the biggest challenge is that you face? 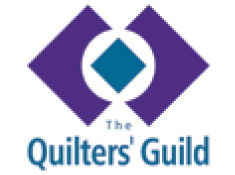 As a quilter today? BC: Yes. Working outside of my comfort zone. [PH: Right] [PH and BC laugh]. I um, the criticism and it was a very fair criticism my tutor made of me during my City and Guilds Course, er, she was very kind in her commendation of the things that I did, but um, she did make the observation to say that you know you’re going you know if you’re if you want to move on it’s to try and move outside of your geometric comfort zone. [PH: Right.] And it’s a very fair criticism I don’t, I didn’t, it didn’t hurt me at all. [PH: No no.] It was a very it was a very constructive and um appropriate thing to say and I um… When I went to the… one of my reasons for going to the NEC was that I’d found somebody who will do the Level Three. [PH: Right.] Which means that I will have to commute again to London, um, to do the City and Guilds Level Three and I went to that person’s, er, little stall. [PH: Yeah.] In the hope of seeing them, but they weren’t there they were teaching. [PH: Yeah.] And one of their friends and the sister of the person was there and I said to them I said ‘I’ve registered to do the Level Three’ I said ‘Can you just assure me that this person will kick me [PH laughs] out of my comfort zone?’ [PH: Right] [laughs] I said, you know, I said ‘I recognise you know I’m a 61 year old man who is shaped by his own life’ [PH: Yeah.] for whatever reason’ [PH: Yeah.] and um it would be good to for somebody to come along and say ‘well have you considered this?’ [PH: Yeah.] or ‘have you considered that? Well why not try this and everything else’ and even though I might squeal and chunter and moan [PH laughs] um, actually I know it’s going to be good for me. [PH: Yeah.] Because it will, you know produce bigger and better things for the future. PH: Mm. And you’re obviously willing to take on that challenge. PH: By registering for the course. BC: Very much so. [PH: Yeah.] I you know it I… I suppose when you get when you retire and you look at whatever life you’ve got left you think to yourself, well… you want to make the best of it whatever you’ve got for whatever reason. [PH: Yes.] But for me it, you know, I, I I’d like to think almost to my last breath that you know there is there are still things to learn [PH: Yeah.] and still things to enjoy, um, learning from others. [PH: Yeah.] And possibly whether it… I, I I’m a great believer in constructive encouragement you know, er, by that I mean, you know, um saying ‘have you considered this?’ or ‘you know what about this?’ [PH: Yes.] And everything else. So I’m looking forward to the Level Three and I was reassured by both the friend and the this particular lady is, is um pretty upfront [PH laughs] you know she’ll be very polite but she’s pretty upfront about saying [PH: Yes.] ‘come on you can do better’. [PH: Yeah.] And that and to me whether that’s just partly because of my military background the personality I am, you know, that’s fine, I don’t have a problem, I’m not gonna [sic going to] go away and cry and weep. [PH: No] [laughs] It’s, er, it’s a chance to um develop [PH: Yeah.] and discover more things you’d never… you’re never going to be at the top of your tree there’s always going to be somebody better. [PH: Yes.] In one sense. [PH: Yes.] And certainly when I went around the NEC and saw some amazing work [PH: Yeah.] I thought to myself ‘well, take heart Bob you’re never gonna [sic going to] get there. [PH: No.] you just don’t have the lifetime to do that’ [PH and BC laugh]. [PH: Yeah.] But conversely is to say don’t be depressed by it [PH: No.] you know. [PH: Yeah.] Just learn from it. [PH: Yes.] And wonder and, and actually the thing I liked about the… a lot of the exhibition places was that, if people had time they were perfectly happy to talk to you [PH: Yeah.] and say well you know how did you achieve this? [PH: Yes.] And before you know it you’re having a free lesson [PH: Yes] [Laughs] for five or ten minutes [PH: Yeah.] because they’re, they’re just as happy to talk about it [PH: Yes.] because there is a passion and an enthusiasm for what they do. [PH:Yeah.] Er and a chance for them to express and so you pick things up [PH: Yeah.] just in that process. BC: I have to be honest with you I’m nervous about joining a quilting group… um… and the reason that I, I suppose I’m nervous about joining a quilting group, and I’ve got to get over this my daughter teases me, [PH: Right] [laughs] um that, um they I, I think I’ve got too mentally trapped by this idea of the, the quilt police, or the quilt traffic wardens as I call them, um and thinking I was very safe in this place at Morley College and we had great fun up there doing it and I felt very content there um, I, I just feel nervous about coming across somebody who might, you know… almost sort of look down their nose at what you’re doing. [PH: Right.] You know it’s a peculiar thing. [PH: Yes.] But that’s, that’s my problem. [PH: Yes] [laughs] That that that is my issue I recognise that [PH: Yeah.] and that’s something I’ve gotta [sic got to] overcome. PH: Yeah. Yes because you might enjoy it. BC: I think I most probably would. [PH: Yes, yes] [laughs] But I’ve got to overcome this… [PH: Yes] [laughs] fear [PH and BC laugh]. [PH: Yes, yes, yes, yeah, yeah.] You know but but, but equally I mean I don’t know whether you’re aware of it on Google there’s, er, a very good chap American called the Quilting Cowboy [PH: No.]. And he does some very good stuff, er, and it’s very interesting er I, I look at that and I think ‘oh you know…’ and you get the impression, for good or ill, that there is er… a greater liberty that’s say out in America for men to be operating in whatever art form they choose to. Or whether, and the other question I ask myself is, am I just a victim of my own generation? [PH: Yeah.] That basically said, you know, ‘blokes don’t do this sort of thing?’ [PH: Yes, yes] [laughs] You know and that’s something I’ve got to sort out myself. [PH: Yeah.] And that’s just er I think that’s part of the journey. [PH: Yeah.] And I you know and and I, I yes going back to the banner, the reason why we’re here, I had a moment when I was chatting to one of the ladies who very kindly helped with the hand sewing and we I can’t remember what we’re talking about [PH: Mm.] but I realised that she made a comment which, er, she subsequently emailed me about, almost as an apology. You know, sometimes in your life people might say something and it might hit, hit something in your emotion [PH: Yeah.] and you know that actually you can’t stop the tears rolling down your face [PH: Yeah, yeah.] something has touched you. [PH: Yeah.] And I can’t remember what she said [PH: No.] to be perfectly honest with you [PH: Yeah.] it was relating to the banner, [PH: Yeah.] but I could not answer her, you know, you have an answer [PH: Yeah.] where you’re [BC takes a deep breath] few deep breaths, you’ve got to compose yourself and you think ‘oh I’m going to myself look a complete and utter ninny here’. [PH: Mm.] And. and she very kindly sent me an email the following day she said I obviously touched something and I said yes, I’m not sure what it was but it, it was something about the quilt and I’ve mentioned before I, I don’t have an umbilical with it. [PH: No.] It is a gift to the Church in Canterbury and whatever that community choose to do with it… it’s part of me says I would be very disappointed if it was just folded up and thrown in the cupboard, um, because there is part of me that say, actually I would quite like it to be a source of encouragement [PH: Yeah.] to people say out in Nepal [PH: Yeah, yeah.] or somewhere like that. Um but as I say there’s a there’s a there is a group of folk there at the moment who have, um, a much stronger attachment to it than I do. [PH: Mm.] And that’s people who just see it as theirs [PH: Yes, yeah.] because it has Canterbury Corps written on it. PH: So it’s unlikely to be put in a cupboard. BC: Well I well I, I, I have a feeling. [PH: Yeah.] Well I might be wrong but I have a feeling there’s going to be a fairly powerful voice of, erm, let’s put it this way strong-minded people who, um, will let their views be known. [PH: Yeah.] Let’s put it that way. PH: Yes [PH and BC laugh]. Yeah, yeah. Okay and there’s just one more question I just wanted to ask you which is um I mean you’ve kind of touched on it during the interview, but just to sort of concisely sum it up, why quiltmaking is important in your life? PH: Yeah. Okay. Well thank you very much I think that kind of concludes what we were hoping to cover. PH: So thank you very much.